Saturn is the second largest planet in the solar system and the only one with a spectacular ring system easily visible from Earth. 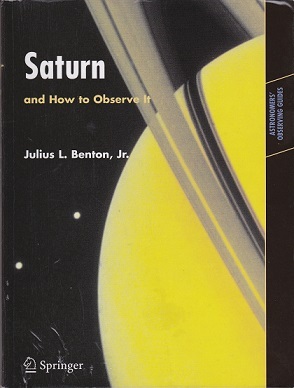 Julius Benton’s Saturn and How to Observe It provides a compendium of the latest information and amateur and professional images of Saturn. These images are followed by advice on how to observe Saturn using a variety of telescope apertures, colour filters and magnifications. This text is a goldmine of information for all levels of amateur observers, from the beginner to the highly experienced. Brought to life by crisp colour photographs, Saturn and How to Observe It is a modern comprehensive review of Saturn as a planet and its magnificent ring system. The book includes some of the latest detailed theories and physical descriptions of Saturn and it satellites. The techniques for observing Saturn are outlined in the book, along with a thorough explanation of what they are viewing.